Most of the newsletters we receive are rather annoying. That’s because they are not really newsletters, but promotions. They are not intended for reading, but to grab our attention and make us click to see some sort of a deal or announcement. The personal newsletter is different. It’s like a little essay, sent by a real person, designed to be read right inside your inbox, and written in a much more intimate, less formal tone of voice. That’s a big difference, which clearly shows in the open rates that are often in the 50–60% range compared to an average of below 20% for commercial emails. As more and more people are getting interested in sending a personal newsletter, we thought it was time to provide a detailed guide. At Revue, we provide a tool for authors of personal newsletters as well as a directory of the best personal newsletters for readers. We have almost 30.000 authors that send out some 3 million personal newsletters every month and wanted to share our learnings about what exactly is a personal newsletter, provide some great examples for inspiration and give advice on how to start yours! So what exactly is a personal newsletter? What gives it the personal touch that makes people want to have it in their inbox, and read it from beginning to end? Rather than the generic “donotreply@domain.com”, a personal newsletter is sent in the author’s name. Readers will open the personal newsletter because they recognize who it’s from. They trust the individual and will be compelled to read what they have to say, and often even reply and start a dialogue. A great case in point is new media company Axios. Launched only in the beginning of 2017, they have quickly become a household name by focusing on personal newsletters. 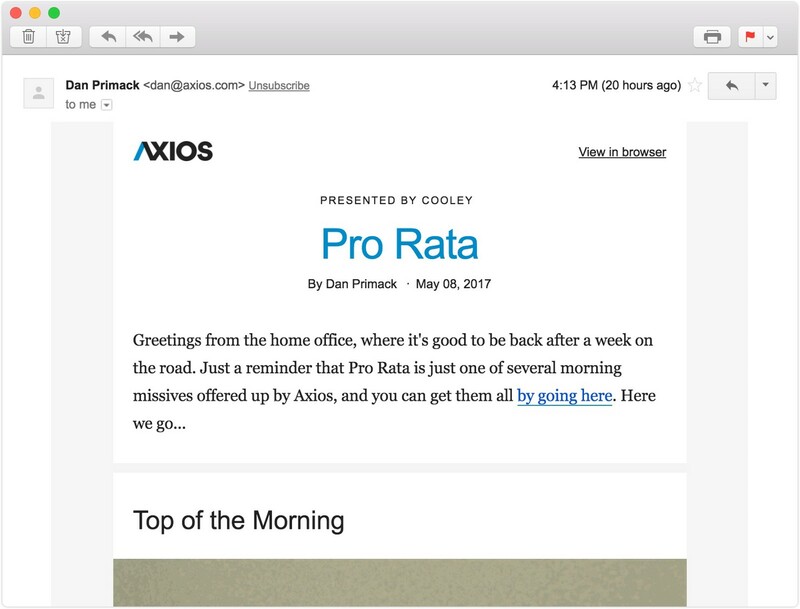 Like many others, we cannot wait to see Dan Primack’s latest issue of “Axios Pro Rata” in our inbox. And we trust Dan to give us insights on the most important deals. He has done it many times in the past and is always available personally for questions or suggestions. 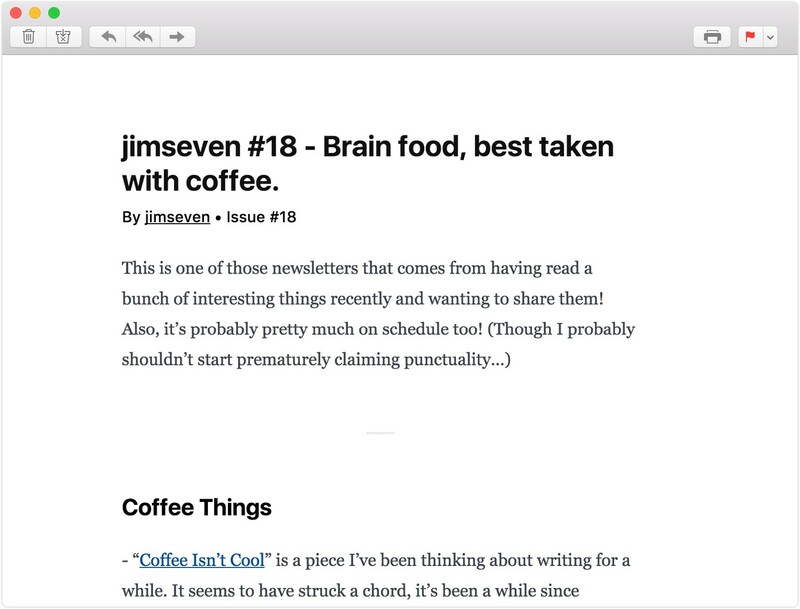 Personal newsletters are designed to be read, right inside the inbox. To succeed at that, the best ones heavily lean on text, replacing highly styled layouts and plenty of images with the email layout people use to send regular emails to their contacts. Take the Daily Skimm, for example, a highly popular personal newsletter delivering news to urban women. It’s layout is very simple, composed of only text, headings and links. While links are provided for further reading, you can read enough of it right in your email client and feel sufficiently informed. People love a scoop, and being spoken to like normal people. Email being less public than social media or a blog, provides a great opportunity to authors to communicate much more intimately. This can include choosing edgier topics as well as employing a less formal tone of voice. The NYTimes recently caught onto this. While their newspaper and website are very factual, they dare to get more personal in their email newsletters. Several of their newsletters are sent personally by one of their journalists or correspondents. 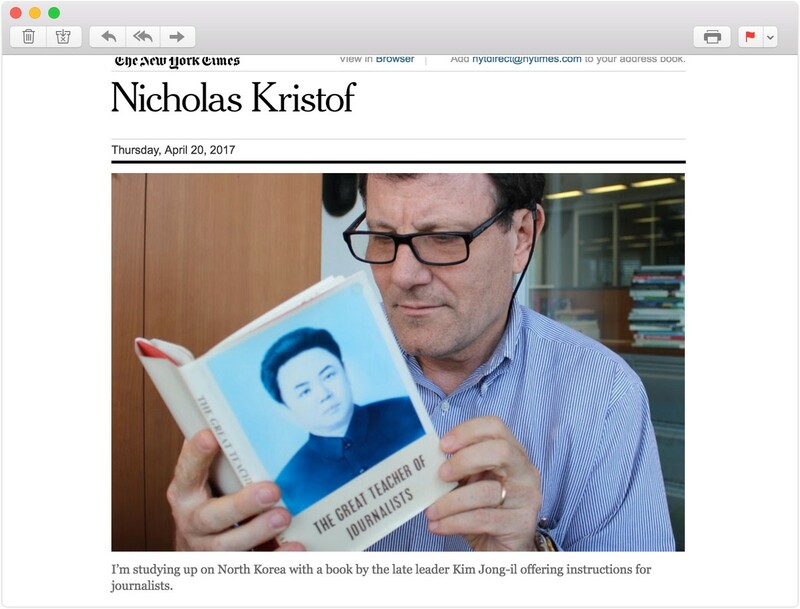 Below is an example of Nicholas Kristof’s newsletter who gets personal with a fun image and an accessible, colloquial style. So who should write a personal newsletter? Do you need a large following and advanced technical and marketing skills? The great thing is, you don’t! The personal newsletter is ideally suited for small brands and even individuals with an expertise or opinion. It gives a voice to anyone who is willing to share their thoughts. Email as a delivery mechanism makes it okay to have a smaller audience and focus on a niche. And not only can a personal newsletter be written without an entire creative and editorial team. It actually often gets more personal and intimate if written directly by the author. So why should you write a personal newsletter? What are the benefits? What are the advantages compared to social media, blogging or promotional email? While promotional newsletters usually have open rates well below 20%, and many tweets and Facebook posts struggle to get a few impressions, personal newsletters do get read. People will notice the personal newsletter in their inbox and be eager to open the latest issue. The holy inbox has been named so for a reason. It is a very private part of the virtual world for pretty much every person. Best of all, nowadays with the growing use of mobile, people can read everything in their inbox while on the go, very often without even needing internet. That’s something that social media and blogs fall behind on. There’s nothing like it. Social media and blog posts are quite different from the personal email. With digests, it’s much easier to start a conversation with your audience, which by the way makes them that much more devoted and loyal of an audience. There’s a certain level of exclusivity to personal newsletters — not everyone gets them. They reach you by landing in your inbox, not the other way around. In personal newsletters curators have the freedom to express themselves in whatever way they like. Because it is mostly about being original, authentic and real. Virality is not really a priority in the personal newsletter world. But that isn’t a bad thing. With personal newsletters you can be a lot more informal, as if you’re writing to a close friend of yours. It’s a safe space where you can really let your personality shine through. With social media, you don’t really own your followers. They get targeted by many competing advertisers and social networks might even charge you to reach them. With email, you decide what goes into the email and which platform you send that email from. There’s plenty of information about you and your brand out there. A personal newsletter is a great of way deepening it. You will be able to stay top of mind by repeating the brand messages regularly, in different ways, adding opinions and other perspectives. And you will be able to add nuances for your most loyal fans. We feel that a great starting point is to start reading personal newsletters for inspiration and suggest that you follow some of the big ones as well as some smaller ones from your field. For starters we have listed some great ones below from thought leaders, entrepreneurs, experts, journalists, bloggers, artists and celebrities. To find additional ones in your area of business or expertise, we advise to head over to Discover, our searchable directory of the best personal newsletters on any topic and find your personal favorites. There are many tools you can use to send your personal newsletter. Your regular email client might be enough to get started and also promotional newsletter tools can be customized given enough time and resources. An even better option are specialized tools that make it quick and easy to get started while assuring you to get that coveted personal note. Productive authoring tool: You need an authoring environment that makes you want to write. It should give you focus to pen those personal stories. And it should help you pull in content that you or others have shared previously using drag and drop. 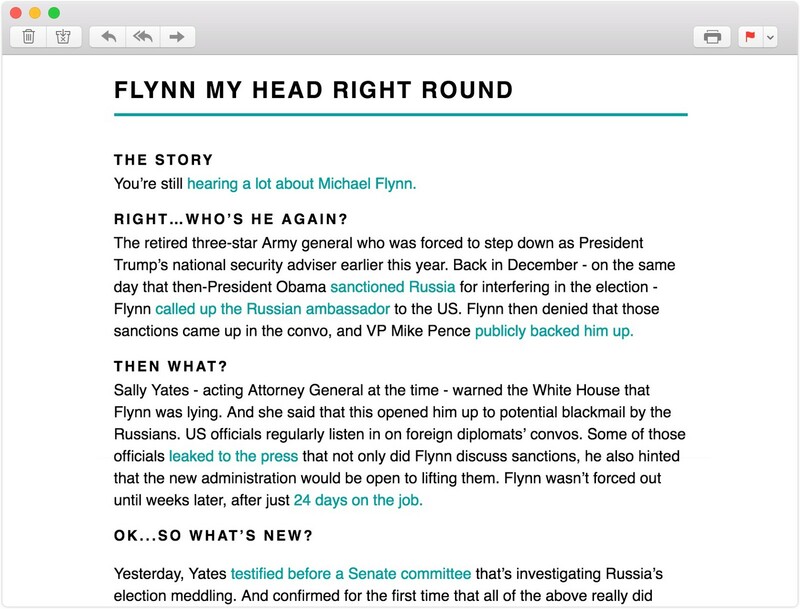 And while we realize we are biased, we did want to suggest you check out Revue, which was specifically designed for personal newsletters. Personal newsletters often develop a dynamic of their own. We recommend that you simply get started and give it a chance to evolve. Whether you are a blogger, small business owner or speaker. You likely already have an address book full of email addresses of people you have not spoken to in too long. Start by inviting them to your personal newsletter. And pick 3 or 4 topics that will get you through the first month of personal newsletters. For each topic, start with a personal story or your opinion and then add relevant curated content that provides background. You will be surprised by how quickly you will learn. You can expect frequent feedback from readers, and will get a feel for that personal style of yours. You might not be after every casual Twitter follower, but the point of a personal newsletter after all is to reach people. So how do you build your audience once you have sent those first issues and started to hit your stride? Ask readers to forward or share: This is email, after all, and people are used to forwarding messages. So just ask them kindly with a sentence or two. You will be surprised to see how willing your audience will be to share if you are being funny, open or simply yourself. Post on social: While the point of a personal newsletter is to be different from social media, there’s nothing wrong with sharing your posts on social media. We even wrote a detailed piece, specifically focusing on that, check it out! Collect email address with pop-ups: The same goes for tying into your blog or website. Your personal newsletter should have a distinct style and original content, but it’s certainly fine to promote it on your blog or website. Also, if you happen to post on Medium, you can embed a signup form to get people to directly subscribe to your digest. We recommend collecting interesting topics and links constantly, and then setting aside a certain time of the day to pick one and write and send your personal newsletter. So what’s a good way to come up with new topics? Chime in on current events: The topic is often something current like a hot news item or conference or other event. You will usually want to start with your personal take, and then build out the content by curating other perspectives, in depth background articles or other related content. Follow other blogs and newsletters: Make sure to regularly visit blogs and publications you find interesting. The content you find there can be later used as basis for your thoughts in your issues. 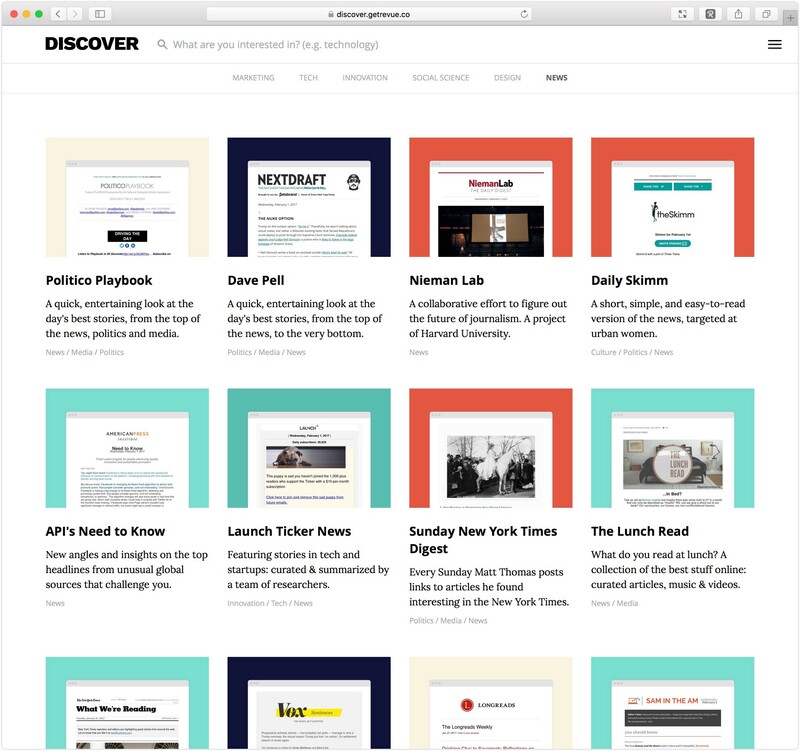 Use Pocket or the Revue Chrome extension: Another way to collect content for your newsletter is to save interesting articles while browsing the Internet. During the day you are reading multiple articles and pieces that you can easily save using tools like Pocket or the Revue Chrome extension. It’s a personal newsletter and your readers will be happy to respond. By targeting your audience you will gain valuable insights into what they want to actually read about. And email being private allows you to ask for feedback easily and will put your readers at ease to share any suggestions or even constructive criticism without being afraid to do so publicly. What are good examples of personal newsletters for inspiration? Still looking for inspiration before getting started? Here are some great examples by some of the best thought leaders, entrepreneurs, experts, journalists, bloggers, artists and celebrities. Speakers, evangelists and thought leaders do big and significant things. They have an opinion that matters and are usually very present. For them, a personal newsletter is a great addition that allows them to make sure their most loyal followers don’t miss their most important content. The intimate nature of the personal newsletter is also appealing as it allows the audience to have more private discussions with experts. Take Tim Ferris, whose “4 hour work week” made him famous and who appears frequently at events, podcasts and even on TV. 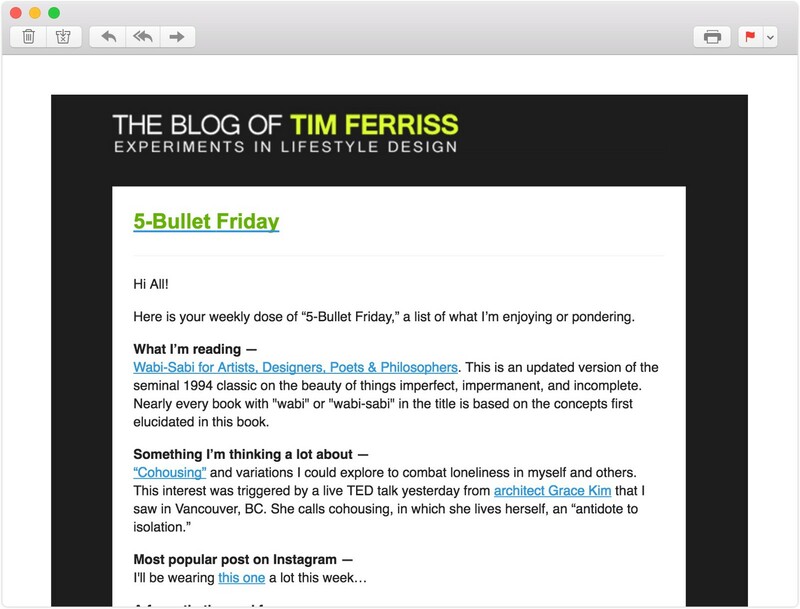 He has added a very successful weekly newsletter called “5 Bullet Fridays”. It’s sent once per week and contains his most popular post of the week as well as other cool things he ponders upon each week, ranging from ancient works of philosophers, cool gadgets and other totally different things. One of the key tasks of an entrepreneur or founder is to build a network of people — potential investors, potential clients, potential partners, potential employees and many more. A personal newsletter is a great way of doing this. It’s sent by email and likely to reach people and get read. And it’s sufficiently private to allow sharing enough details. In case you’re interested in learning from someone who’s already doing that, take a look at the Amsterdam based sales & PR consultancy TwoTone. They send out a weekly personal newsletter that mixes business and fun. Next to useful tips about startups and sales, they talk a lot about their passion, which happens to be cycling. Entrepreneurs and small business owners are passionate experts. For them, a personal newsletter is a great way to tell the story of the brand, keep people updated on what is happening and talk to customers a lot more often than by only relying on social media. It’s a way to show what is happening behind the curtains and develop a very strong sense for your brand. James Hoffmann, owner of Square Mile Coffee Roasters, world barista champion, and author of the world atlas of coffee is very successful at this strategy. He sends out a bi-weekly newsletter on coffee, carefully curated and full of expertise. One of the best groups to make use of personal newsletters is people who know a lot about something and are willing to share it. Consultants, freelancers and other experts want to be successful in their own niche and email is a great solution. There is less noise than in social and there are no constraints to length. Finimize, which explains financial matters in simple terms, is a great example. The authors take current events and provide commentary. They provide great insights into the personal consequences of financial news to their readers. Plenty of journalists and authors are constantly on Twitter and Facebook in order to stay informed on the latest news and trends about the field they’re writing about. And even though they share frequently on there, their readers might not. The personal newsletter therefore is a great way of communicating what matters but did not make it into the publication. There’s even examples of journalists that exclusively publish via email these days. Dave Pell has turned his addiction to news into a one man email publishing house, scouring some 70 news sites every day so that his readers don’t have to, and updating them by email with everything they need to know once per day. Bloggers need ways of making sure their blog content reaches their audience. They often do so by announcing blog posts on social channels or sending email notifications. Social channels, however, are noisy and email notifications rather bland and impersonal. That’s where personal newsletter come in. Being sent out by the blogger, they can contain recent posts but also related content from other sources, which in the end is a great way to engage readers. We personally love the story of Bob Lefsetz who analyzes the music industry with his “Leftsetz Letter”. While he never made it into the music industry the traditional way, he managed to do so via his personal newsletter. His personal newsletter has had so much success that it has slowly replaced his blog as his main outlet, and is read religiously by the entire industry. What a story. Personal newsletters provide the perfect platform for photographers, artists, musicians or simply enthusiasts. On one hand, they might get more easily noticed by others when providing their knowledge and expertise when building a proper email list. A personal newsletter is also convenient for sharing longer content, like a collection for example. Samuel Zeller is an example of a photographer who sends out a curated list of articles, videos and links related to photography to his audience. He also updates his readers on the latest projects he’s currently working on. Having a personal newsletter happens to be a trend among certain celebrities who tend to be more outspoken about various issues. The personal email digest written and curated by a celebrity can have a significant impact on people. Also, they tend to feel much more approachable given the diverse, more intimate information they share. Actress Lena Dunham with her revolutionary Lenny Letter has been making history or a while now. Her digest aims to empower women and in general to discuss issues that are often not brought up so often. Every issue is like a thought piece on its own that will definitely leave you with some food for thought. 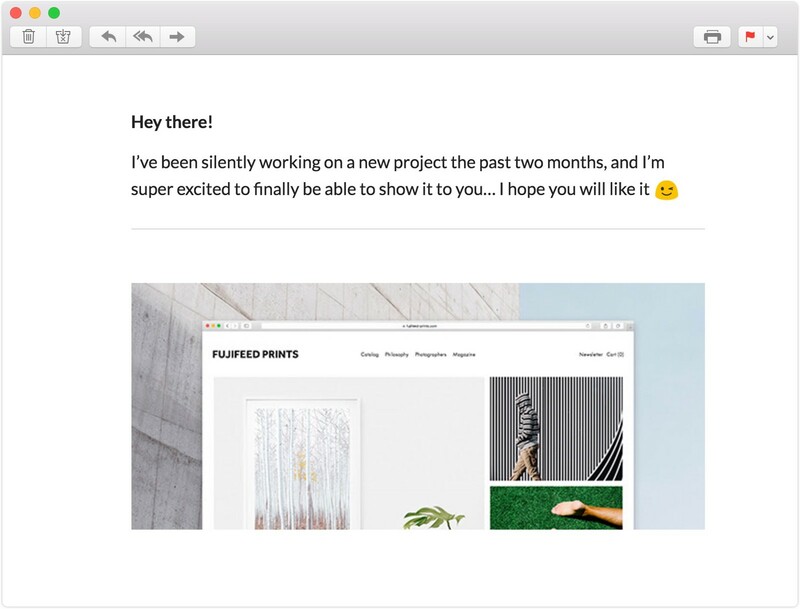 Personal newsletters are a great outlet for designers and creatives who are always working on the next cool thing and want to share whatever projects they’re working on currently. There’s plenty of space to be creative in an email and fewer restrictions on what content is OK to share. A great example that may serve you as an inspiration here is the “Desk of Tobias van Schneider”. He regularly curates about design and other, more broad topics such as freelancing and travel. Inside you’ll find articles he hasn’t shared anywhere else, updates on his projects, insights, reading recommendations and everything in-between. After reading this, you realized you want to start your own personal newsletter? Simply head over to Revue and start sending your thoughts into people’s inboxes today! You write and curate, we make sure it looks good.